The four Democratic gubernatorial candidates. 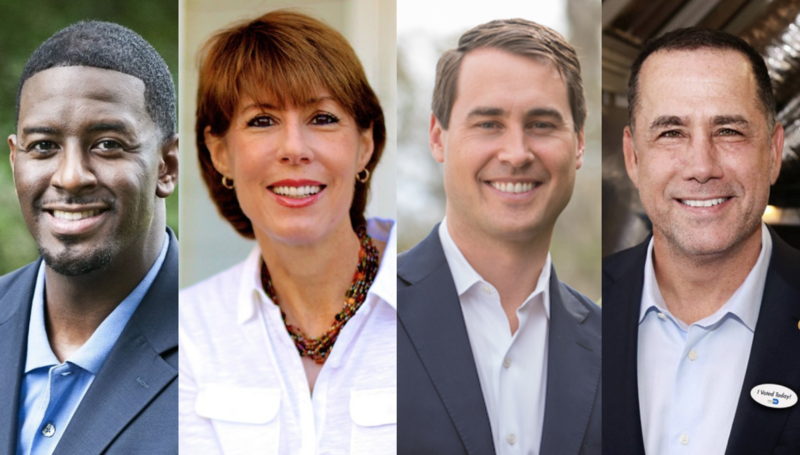 The invited candidates are Tallahassee Mayor Andrew Gillum, Former U.S. Representative Gwen Graham, Orlando entrepreneur Chris King and Former Miami Beach Mayor Philip Levine. Jeff Green is also a candidate for governor race but did not qualify for this debate. The debate will be co-moderated by WLRN’s All Things Considered and Sundial host Luis Hernandez and PBS NewsHour’s Yamiche Alcindor. It will be held Monday, June 11, at the Miramar Cultural Center. Doors open at 5:30 p.m. It will be carried live on WLRN radio. Coverage starts at 7 p.m.
Who are the Democratic gubernatorial candidates? Mayor Andrew Gillum grew up in Miami and was the youngest person in history elected to the Tallahassee City Commission. His platforms include reducing economic inequality, expanding healthcare access, transitioning Florida to clean energy, fighting mass deportation, enacting common sense gun policies, protecting women's independent healthcare decisions, advancing LGBTQ equality, legalizing marijuana to reduce sentences for low-level drug offenses and rebuilding Florida’s education system. After working as an attorney and serving as a PTA President, Gwen Graham ran for Congress against incumbent Republican Congressman Steve Southerland in 2014. In a conservative district, Graham was one of the only Democrats in the entire country to defeat an incumbent Republican that year. Her focus for the 2018 governor’s race rests heavily on raising Florida education standards and teacher salaries, lowering in-state college tuition, Florida wildlife conservation, expanding Medicaid and reducing costs for medications and premiums, women’s and LGBTQ rights, gun safety laws and supporting a path to citizenship for undocumented immigrants. Chris King is not a professional politician. But the Orlando native and entrepreneur focuses his campaign on core family values. He started off his campaign with a week-long South Florida “Affordable Living Tour,” and has made housing one of his top priorities during this 2018 governor’s race, especially for senior citizens. Other issues include passing Florida’s LGBTQ bill, raising the minimum wage and investing in Florida’s education system. King’s foundation helps fund programs that focus on college access and mentorship for low-income Florida students. King has also proposed the ‘Every Kid Fund’ for Gun Violence Prevention that would invest in programs to study and reduce the epidemic of gun violence. Democratic candidate Philip Levine served as Mayor of Miami Beach from 2013 to 2017. Levine was born in Boston, Massachusetts but has lived in Florida for 40 years. Levine, who was businessman before turning to politics, says his biggest priority is to improve Florida’s economy. He is doing this by focusing on raising the minimum wage, investing in public education, reforming the police department and protecting the environment by mitigating climate change. Jeff Green entered the Democratic gubernatorial race last week. Green is a real estate entrepreneur and was a candidate for the 2010 Senate election primaries in Florida where he spent about $23 million of his own money on the campaign. According to the Florida Division of Elections, Green filed papers declaring his candidacy for governor on June 1. He did not qualify to participate in the debate.